Spring is almost here, and the clocks have moved forward which means losing an hour of sleep in the mornings. Losing that extra hour of sleep means it’s been tough getting out of bed and getting into my morning routine. To be honest, I’ve been sleeping in as late as possible – which isn’t very late at all. I’m so out of it in the mornings that I’ve simplified breakfast even more than the usually egg, sausage and bread. I’ve been using Quaker® Real Medleys SuperGrains Blueberry Pecan granola sprinkled over fresh fruit and yogurt or just with milk and a bit of fruit have made mornings just a bit easier. 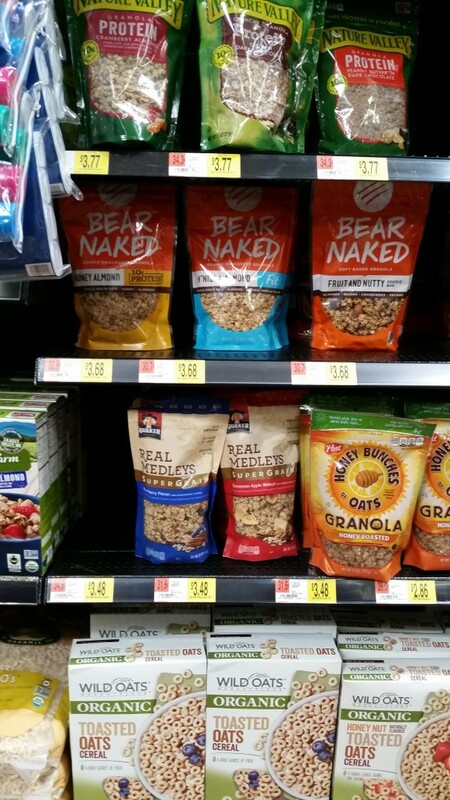 Real Medleys SuperGrains Blueberry Pecan granola has whole grain oats, flaxseed, red quinoa, sunflower seeds, whole grain wheat, barley and amaranth so it gives you that extra boost of energy that you need in the mornings. It’s even great to snack on and is great in desserts; it adds a bit of texture without being too sweet or overindulgent! I grabbed a couple bags from Walmart on my last grocery trip because anything that can make my life a little bit easier is at the top of my list. 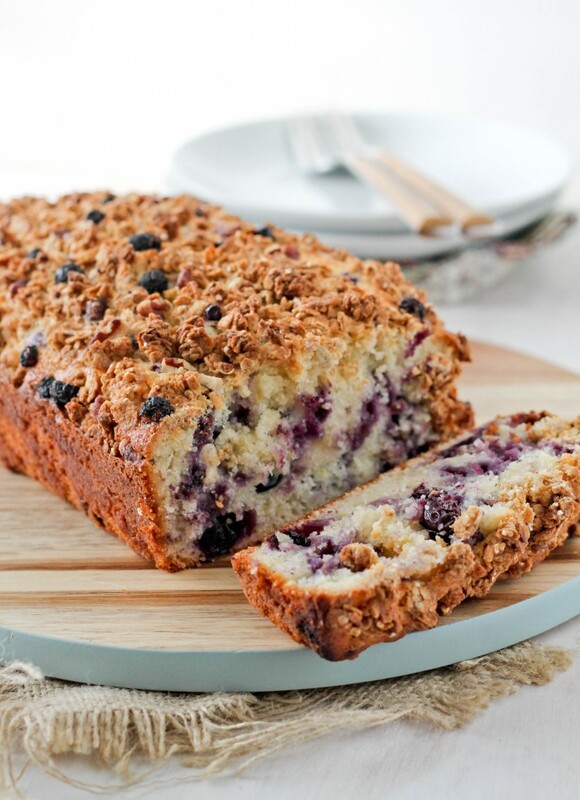 I even made a Lemon Blueberry Bread with a crunchy granola topping using the Real Medley’s SuperGrains Blueberry Pecan. 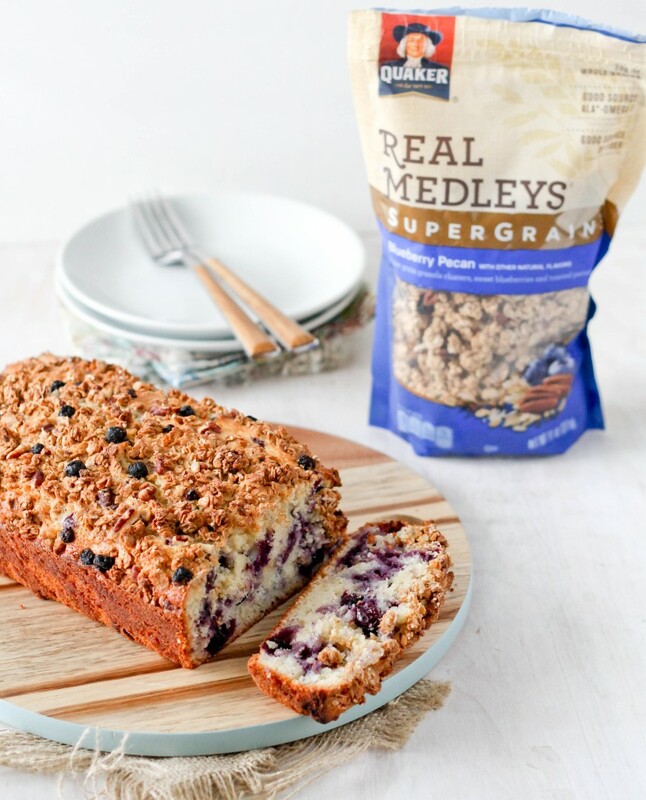 The Real Medley’s SuperGrains granola adds a nice crunch and texture while the blueberries make this bread super moist and the lemon adds a burst of flavor. 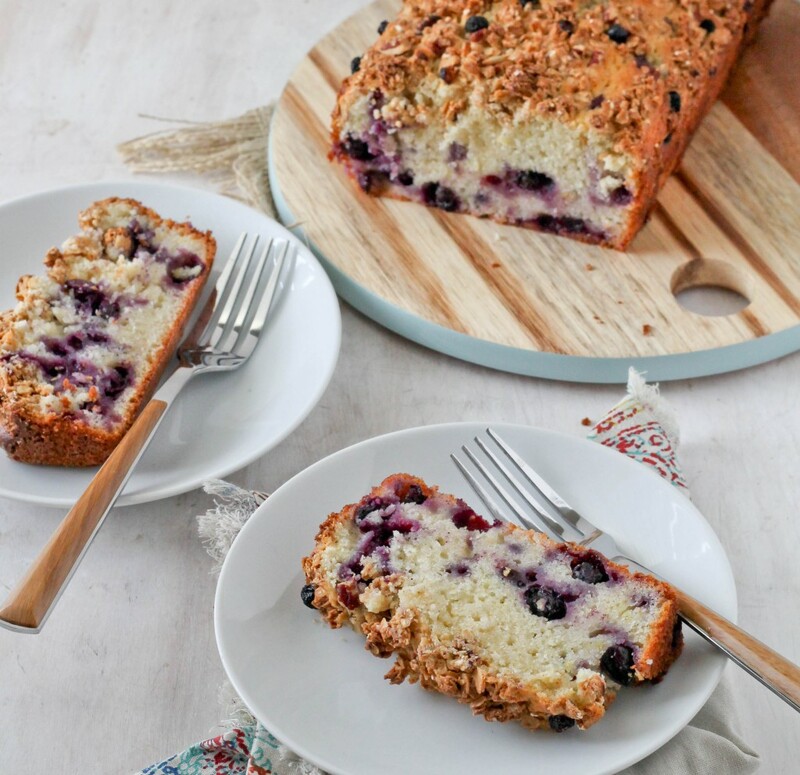 This Lemon Blueberry bread reminds me that spring is just around the corner! In a bowl beat butter, sugar, lemon juice and eggs. In a small bowl mix flour, baking powder and salt then mix flour mixture into egg mixture alternating with the milk. Beat well with each addition. Stir in blueberries and lemon zest. 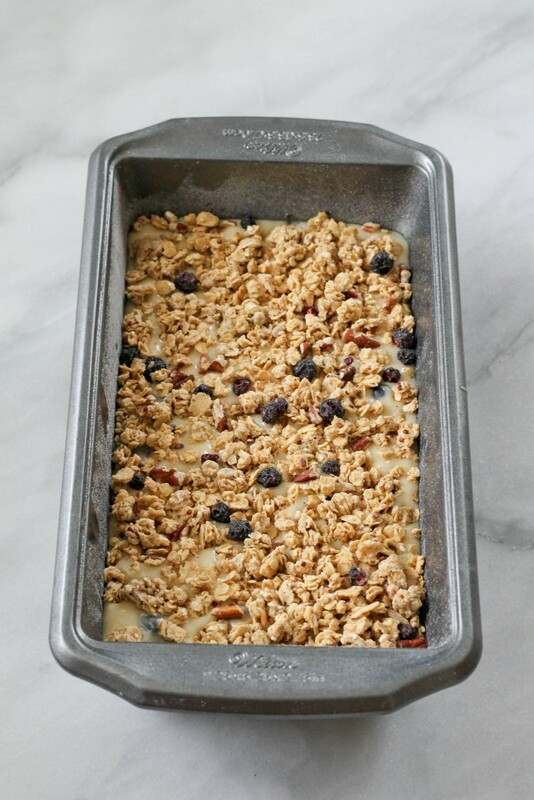 Place mixture in a greased 8×4 inch loaf pan and then sprinkle the Real Medley’s SuperGrains granola over the top; press gently into the batter then place into preheated oven and bake for 60 minutes. Cool for half hour before removing from pan. Let cool completely before slicing. This looks absolutely amazing and I am almost certain that I am making this tonight. 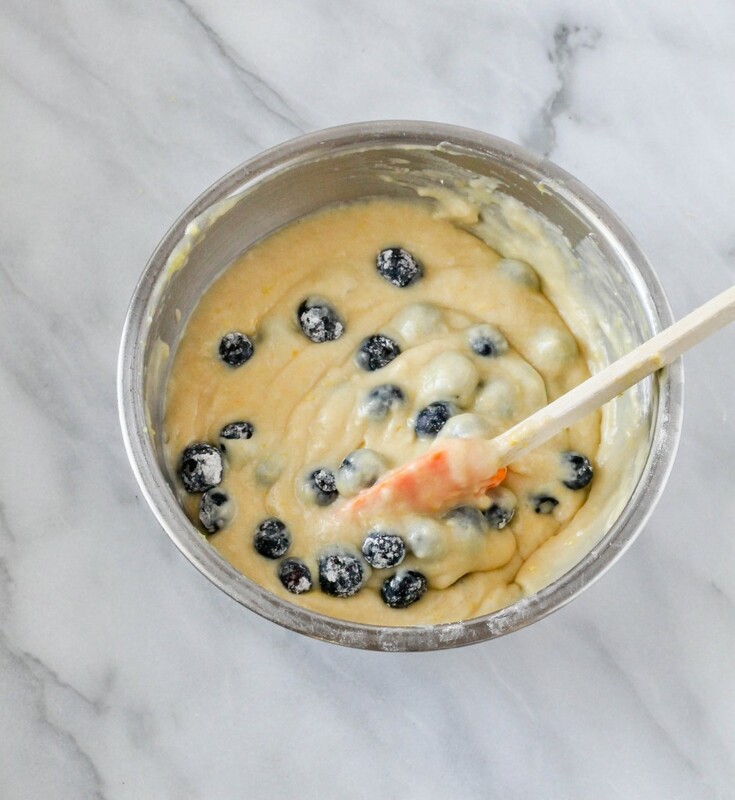 I’m baking this right now the batter looks beautiful. I used mandarin zest instead of lemon. Plus I used fruit and nut muesli instead of granola. I hope it tastes as awesome as it smells!